A few weeks back, I wrote a series of blog posts (Part 1, Part 2, Part 3) on how Tintri simplifies chargeback/showback for service providers (SPs). With the release of manual quality of service (QoS) per virtual machine (VM) and the introduction of normalized IOPS, Tintri has made that value proposition for SPs even better. As we all know, Tintri is the only storage platform that has an always-on dynamic QoS service that ensures QoS at a vDisk level. 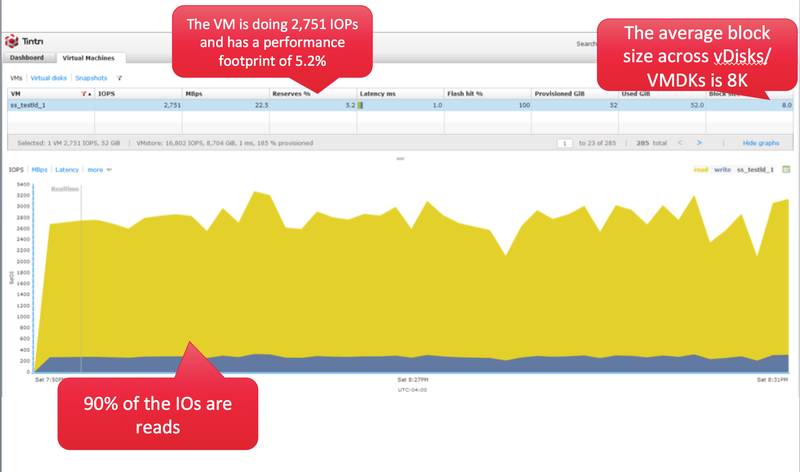 As part of this new functionality, Tintri customers can manually configure QoS at a VM level. QoS on Tintri systems is implemented on normalized IOPS (more on this below) and customers can configure min and/or max settings for individual VMs. The minimum setting guarantees performance when the system is under contention (when you are more than 100% on the Performance Reserves bar) and the maximum setting allows an upper limit on performance for the VM. The new latency visualization gets an enhancement as well with the support for contention and throttle latency visualizations that ensure that QoS doesn’t become a liability. If you want to read more about QoS, head over to the blog post here. There is also a great video posted here. As we all know, different applications have different block sizes. Normalized IOPS allows us to understand the real workload generated by various applications and help create an apples-to-apples comparison between applications. It also makes QoS predictable. When we set up QoS using normalized IOPS, we know exactly what the result will be, instead of getting a skewed result because of the block size of the application. It gives one single parameter for SPs to implement performance-based chargeback/showback. So, instead of considering IOPS, block size, and throughput, and then trying to do some sort of manual reporting and inconsistent chargeback/showback, the SPs get the measurements out of the box. Let’s use an example to see how SPs can take advantage of the new functionality. 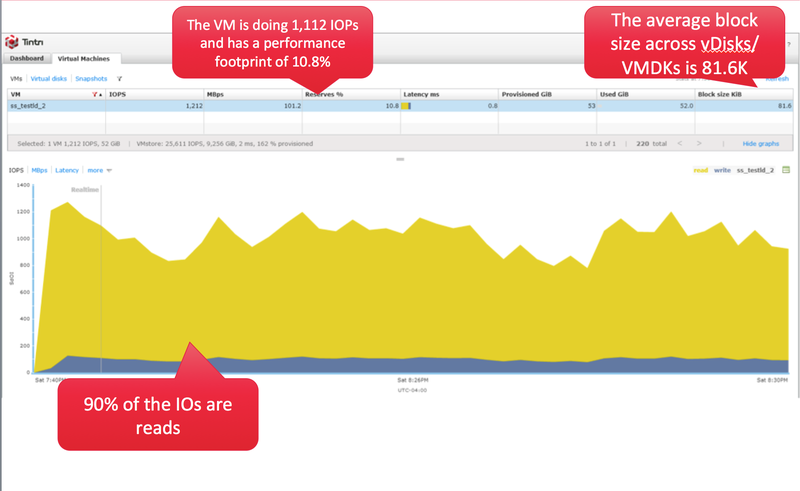 In the above screenshot, we have three VMs and we can see the IOPS and Normalized IOPS for each of these VMs. If we look at just the IOPS, we would be inclined to think that the VM SatSha_tingle is putting the highest load on the system, and that it is 2.7x the VM SatSha_tingle-02. But if we look at the Normalized IOPS, we know the real story. The VM SatSha_tingle-02 is almost 1.5x of SatSha_tingle. This is also reflected in the reserves allocated by the system to the VMs under Reserve%. In a SP environment, without the normalized IOPS, the SP would either end up charging less for SatSha_tingle-02, or would have to look at block size and do some manual calculation to understand the real cost of running the VM. But with Normalized IOPS, the SP can standardize on one parameter for charging based on performance and get more accurate and more predictable with its chargeback/showback. Since Normalized IOPS are also used for setting up QoS, SPs can now guarantee predictable performance to its customers through implementation of min and max IOPS-based QoS. With Normalized IOPS, the SPs now have four different ways to chargeback/showback on Tintri systems: Provisioned space, Used space, Reserves and min/max Normalized IOPS. 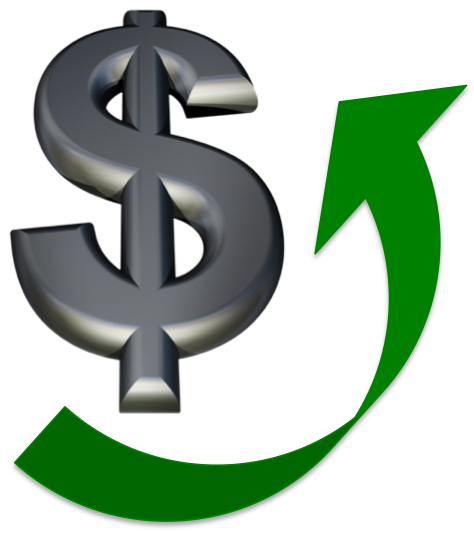 Each of these ways bring more accuracy and predictability to any SPs chargeback/showback model that directly affects their Profitability. In the Part1 of this series, I covered the challenges around Storage Chargeback and Showback in Virtualized environments running on traditional storage platforms that use LUN/Volume Abstraction Layers and in Part2, I covered how Tintri simplifies and brings more accuracy to the Capacity Centric Model with its VM centric design. In this post I will cover how Tintri makes it easy to incorporate a more accurate Performance based model into Chargeback/Showback that can be used in combination with the Capacity Centric Model. As I stated in my first post – although everyone would like to add a performance centric model to Chargeback/Showback, it is not that popular given the complexities around implementing something like that on the storage side in a virtualized environment (refer my first post in the series). As we all know, one of the big advantages (and differentiator) that Tintri has is that its abstraction layer is a vDisk (VMDK, VHD etc.) and not a LUN or a Volume. This allows it to see at the right level of abstraction (rather than looking at a LUN or a Volume). The other advantage that it has is that because of its tight API integration with various hypervisors, it sees a vDisk as a vDisk and not as another file. This ability allows it to create an IO Profile of every vDisk in the system. This IO profile gives Tintri an understanding of the type of IO taking place in side a vDisk (Random, Sequential, %Reads, %Writes, Block Size) based on which it assigns ‘Performance Reserves‘ to every vDisk. The Performance Reserves are a combination various resources in the storage platform – like Flash, CPU shares, Network buffers etc. and are shown by the Tintri Management interface in % values. So if we consider a Database (DB) VM with C: Drive, D: Drive (DB files) and E: Drive (Logs), Tintri would look at those individual drives, learn about the IO profiles (say D: is random IO, E: is sequential and C: not much IO) and then automatically assigns Performance Reserves to these with a goal to deliver 99-10% IO from flash and sub-ms response times. 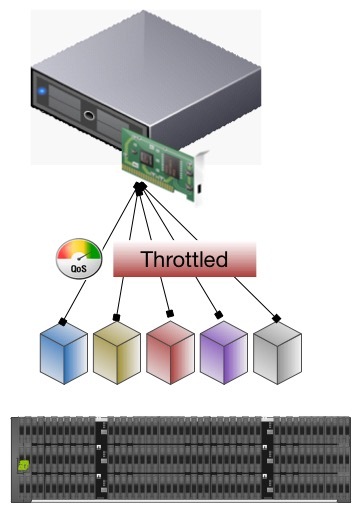 The first benefit (as I have discussed in my other posts) of this approach is that Tintri automatically tunes itself unlike some other storage products that just show some values (most of them at a LUN/Volume level) and require the admin to take action – like add/buy more flash, reshuffle the VMs, reduce CPU/cache load etc. The second benefit, the one that we will discuss here in more detail, is that IT/Service Providers now have a metric against which they can do a Chargeback/Showback. Performance Reserves are independent of IOPs and are a measure of how much Storage resources are consumed (or will be consumed) by the vDisk in order to get 99-100% IO from flash and sub-ms response times. Traditional Performance centric models that use IOPs as the measure don’t take into consideration the amount of Storage resources consumed by the vDisk to do for a particular type/size of IO. The problem here is the traditional underlying storage architecture that continues to use LUNs/Volumes as the abstraction layer. These Storage products in some cases don’t have an ability to provide a Quality of Service to even those abstraction layers, let alone looking at individual vDisks and automatically tuning various storage resources for a workload. 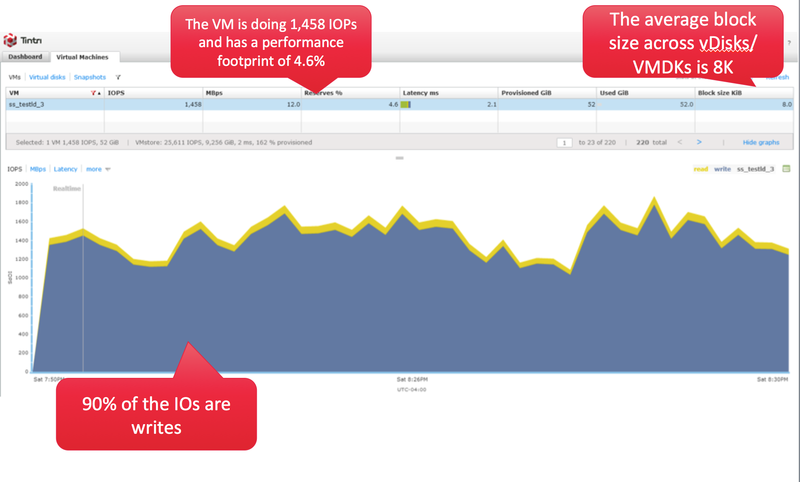 Here we look at a simple example of how three different VMs having different type of IO characteristics get their Performance Reserves assigned by Tintri. The VM ss_testld_1 in the first screenshot is doing 2,751 IOPs (Ave. 8K block size) with 90% Reads and has 5.2% Performance Reserves allocated to it. The VM ss_testld_2 in the second screenshot is doing 1,112 IOPs (Ave. 81.6K block size) with 90% Reads and has 10.8% Performance Reserves allocated to it. The VM ss_testld_3 in the third screenshot is doing 1,458 IOPs (Ave. 8K block size) with 90% Writes and has 4.6% Performance Reserves allocated to it. So what we do we see here? So, if we look at just IOPs, the cost of running ss_testld_1 seems higher but in reality the cost of running ss_testld_2 is more than double that of ss_testld_1. In the same way the VM ss_testld_1 is doing almost double the IOPs (2,751) than the VM ss_testld_3 (1,458) with the same block size (Ave. 8K) but they are using almost similar performance reserves 5.2% and 4.6%) because the latter is heavy on write (90% Writes). Here if we look at just the IOPs, the cost of running ss_testld_1 again seems higher but in reality the cost of running ss_testld_3 is almost the same as ss_testld_1 even with ss_testld_3 doing half the IOPs. If we had taken a IOPs centric model, the costs would have been completely different with no relation to the amount of storage resources consumed to run a particular type of workload. The other big challenge with the IOPs centric model is its unpredictability. Let’s say we sized a storage platform for X IOPs (say 8K) with some read:write, rand:seq mix and then priced per IOP accordingly. What if the platform doesn’t deliver those IOPs (say it delivers Y IOPs) because our assumptions were wrong or because of completely unpredictable workloads. The difference (X-Y) now has to be absorbed somewhere. So to cover that, IT/Service Provider would charge more next time and become uncompetitive. The Performance Reserve metric is independent of the IOPs and can be combined with a Capacity Centric Model (for capacity hungry VMs) to give a more accurate Chargeback/Showback model. The cool thing about all of Tintri’s metrics is that they are all exposed through our REST APIs and Powershell Integration. Therefore these can plug into any customized model as well, giving a more predictable, simplified and accurate Chargeback/Showback Model. In the first post of this three part series, we discussed the challenges around Storage Chargeback and Showback in traditional environments. This post will focus on the Capacity based Model for Chargeback/Showback and how Tintri brings in more accuracy and value add to the model. As we all know (by now – refer my other blog posts), Tintri doesn’t use a LUN/Volume abstraction layer like traditional storage platforms. LUNs/Volumes were designed for physical environments and we just continued to use them for virtualized environments since there was no innovation done by storage vendors specifically for virtualized deployments (until now). Tintri uses vDisks (think VMDKs, VVOLS, VHDs etc.) as the abstraction layer in the storage platform. Using vDisks as the abstraction layer, allows it to see at the right level of abstraction without the added complexity or layers of LUNs/Volumes. What this means to a Service Provider (Internal IT or Public) is that now they can not just look at what is provisioned to a VM or used inside the VM but the overall Capacity Footprint of a VM. The overall Capacity Footprint of a VM not just consists of the Live Data but also space used for other things like Data Protection. In the example below, I have highlighted the VM Demo-A. 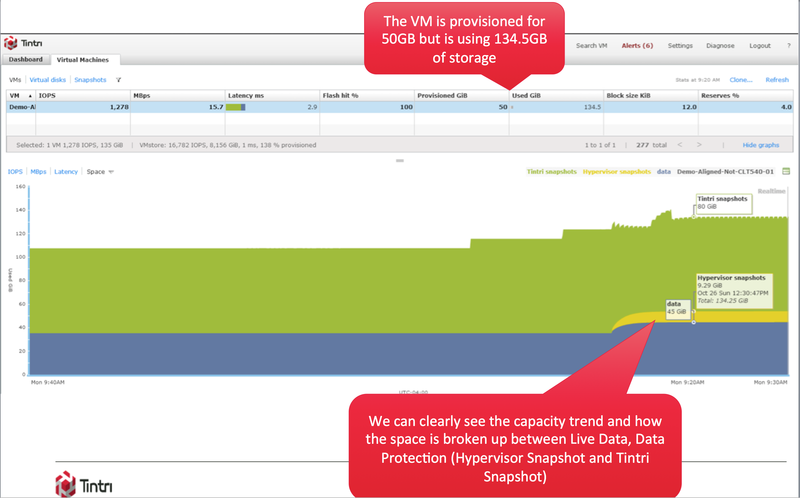 As you can see that in the Tintri GUI, you not only see the provisioned space but also the actual used space by the VM in the Used GiB column. Double clicking the VM shows us various graphs for the VM and in this case I have selected the ‘Space’ Graph that shows us exactly how a 50GiB VM is using 134.5GiBs. We breakdown the 134.5 GiBs into Live Data, Hypervisor Snapshots and Tintri Snapshots to give a complete picture of the Capacity Footprint of the VM. This is not only important because it allows the IT/Service Provider to charge for the right amount of storage consumed by the tenant, therefore increasing the accuracy and predictability around Storage consumption but also because now the IT/Service Provider can provide more insight and value add. As we can see in this example, Tintri brings in more simplicity and accuracy with a Capacity based chargeback/showback model . In the next post, I will discuss the performance based model and how Tintri can help with implementing something that is potentially more accurate than a typical IOPs based model.